ANAHEIM, Calif. (AP) -The Anaheim Ducks scored their first goal after Roberto Luongo wandered way out of the net to head off a breakaway. Their second goal came while they were killing a penalty. That, along with Jonas Hiller's goaltending, was enough to deflate the frustrated Vancouver Canucks. Travis Moen scored his first NHL short-handed goal, Hiller made 30 saves and the defending Stanley Cup champions broke a club record with their eighth straight home victory, beating the Canucks 4-1 on Wednesday night. Todd Marchant scored in his third straight game, helping Anaheim avoid a four-game season sweep by the team they beat in the second round of last year's playoffs. 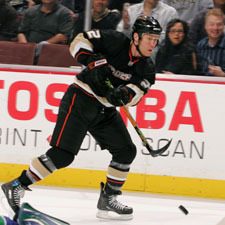 Doug Weight connected during a power play and Rob Niedermayer also scored for the Ducks, who reached 40 wins for the fourth time in five seasons. Luongo, making his 19th consecutive start and 35th in 37 games, was pulled 4:03 into the second period after allowing four goals on 19 shots. It was the third time in 61 starts this season that he was benched during a game by coach Alain Vigneault. "I think it was more of a change of pace than anything else," Luongo said. "The good thing is we play (Thursday) night, right away. So we have a chance to put it behind us right away and focus for tomorrow night's game - which is obviously a huge game for us." 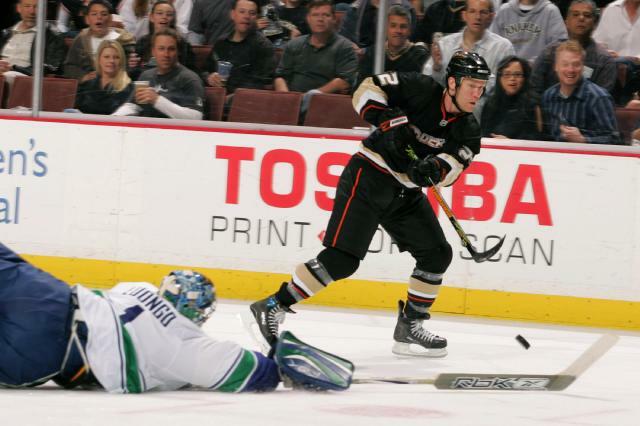 Weight scored Anaheim's fourth goal when Teemu Selanne's short wrist shot from the left of the net ricocheted off the far post and off Weight's chest. The puck landed at Weight's feet, and he converted the rebound for his 10th of the season. Ryan Getzlaf's assist on the goal was his 52nd, the most by a center in the Ducks' 14-season history. Andy McDonald set the previous mark in 2005-06 and tied it last season. Marchant opened the scoring at 10:53 of the first period, just 7 seconds after serving a tripping penalty. Chris Kunitz made a quick clearing pass off the boards after Hiller's save on Sami Salo's long slap shot, and Marchant caught up to the puck in the Vancouver zone with everyone else far behind the play. Luongo came out to the top of the left circle to try to knock the puck away from him, but Marchant swerved around the sprawling goalie and put a wrist shot into the vacated net for his eighth goal. Hiller earned an assist. "I thought I had it, but I think the ice really slowed the puck down," Luongo said. "Obviously, Marchant is a quick skater. So once I made my play and decided to go out there and play it, there's no turning back. I tried to dive at it to maybe poke it away, but it was a bit too late." Marchant is enjoying his first three-game goal streak since December 2005. He scored only five times in his first 64 games this season. "For all those opportunities I had earlier in the year, where the puck should have gone in and didn't, maybe it's starting to happen for me," the 14-year veteran said. "None of my goals have been very pretty, but they all count." Moen made it 2-0 just 2:24 later while teammate Mathieu Schneider was off for interference. It was the eighth short-handed goal this season by the NHL's most penalized team. "Obviously you want to prevent a goal first. But if you get an opening and you get a little bit of a jump on a guy, then you can go," Moen said. "You've also got to remember that if you don't score, you've got to come back just as hard." Niedermayer added his sixth goal at 16:49 of the period, converting a rebound from a sharp angle to the left of the net after Luongo made a save against Moen. "We got down 3-0 early and didn't have a lot of push back," Vigneault said. "You're going to get behind in this league, and sometimes you should be able to come back. But to do that, your best offensive players need to be your best and come up big. And our guys weren't very good." Rookie Mason Raymond got Vancouver on the board by scoring a power-play goal with 2:15 left in the first. Notes: For the second straight season, All-Star C Henrik Sedin didn't score a goal in eight regular-season games the Canucks played against the Ducks and Los Angeles Kings. ... Anaheim has the longest home winning streak in the NHL this season. ... The Ducks are 15-2 at Honda Center since Dec. 18.